Not to be confused with Naval Piranha's Castle. Naval Piranha's Sewer is the eighth level of World 4 in Yoshi's Woolly World. The level begins with a single warp pipe, which leads to a sewer area with Wild Ptooie Piranhas and Piranha Plants. After a while, Yoshi will encounter a Stalking Piranha Plant, followed by a Piranha Plant and another Wild Ptooie Piranha before coming across an edible blue warp pipe. Almost immediately afterwards, Yoshi will be brought through a long waterfall to a door leading to the first checkpoint. After a long segment containing Spinners and Stalking Piranha Plants, there is a warp pipe that leads to a vertical area with spring balls and more Wild Ptooie Piranhas, as well as a few Bomb Guys. The second checkpoint appears soon afterwards, as well as a rainbow assortment of warp pipes. A labyrinth of warp pipes follow. At the end of the labyrinth, a giant spring ball takes Yoshi directly to the boss door. Smiley Flower 1: Inside a green warp pipe guarded by the second Piranha Plant. Inside the secret area, Yoshi must defeat all Nipper Spores to unveil the Smiley Flower. Smiley Flower 2: Near the final edge of the waterfall leading to the first checkpoint. Yoshi must simply flutter jump to get it. 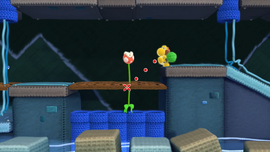 Smiley Flower 3: When encountering the first warp pipe after the first checkpoint, Yoshi must continue to the right to a door. Inside the secret area, Yoshi must evade the Spinners to get the Smiley Flower. Smiley Flower 4: In a hidden Winged Cloud in the spot of a Wild Ptooie Piranha in the vertical segment. Smiley Flower 5: After the rainbow warp pipe maze, Yoshi must enter the warp pipe after the first encountered Bomb Guy, which will lead directly to the Smiley Flower. Wonder Wool 1: Unveiled after hitting a hidden Winged Cloud in the spot of the first Piranha Plant. Wonder Wool 2: To the right of the first edible blue warp pipe, in a hidden Winged Cloud. Wonder Wool 3: When Yoshi approaches a platform with a Spinner and four beads below it in the room with the rotating spiked maces, he must duck under the platform to collect the beads, which will reveal the Wonder Wool. Wonder Wool 4: Just after the second checkpoint, Yoshi must take the orange warp pipe, then the yellow. Once through, Yoshi must then eat the edible wall with Nipper Spore Patches to get the Wonder Wool. Wonder Wool 5: During the final labyrinth of warp pipes, there is a warp pipe outline that Yoshi can fill in via yarn ball and enter. Upon exiting the warp pipe, there is an edible warp pipe that Yoshi can eat, revealing a path to the Wonder Wool. 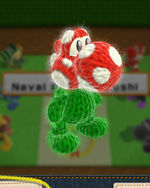 Collecting all of the Wonder Wools knits Naval Piranha Yoshi back together. This page was last edited on March 20, 2019, at 19:00.